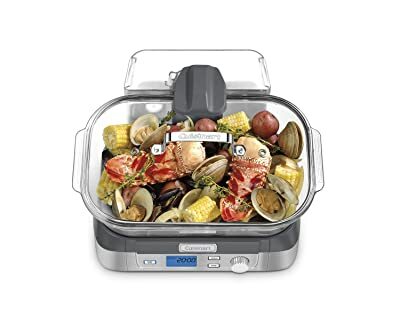 What is the Best Steamer? When steaming food, hot air from heated water is used as the source of heat for cooking. The whole process happens inside a container that’s tightly sealed. This design allows food to retain its moisture content as this can’t evaporate in a sealed environment. The result of the steaming process is delicious, tender, and moist food (not dried up). And since you don’t need oil in the process of steaming, you can avoid this not-so-healthy ingredient. There are certain features that make one model of steamer better than the other. Just think about the following factors listed below – they will influence your decision in choosing a steamer. Design – Steamers can be designed to have 1 tier, 2 tiers, or 3 tiers (these are the most common). This feature refers to the number of layers a particular model has. Needless to say, a lot of tiers would mean more spaces for cooking food. Also, it would be good if the unit can operate without having to use all the levels included in the package. And another thing – having removable bottoms or dividers will allow you to cook bigger types of food in your steamer. 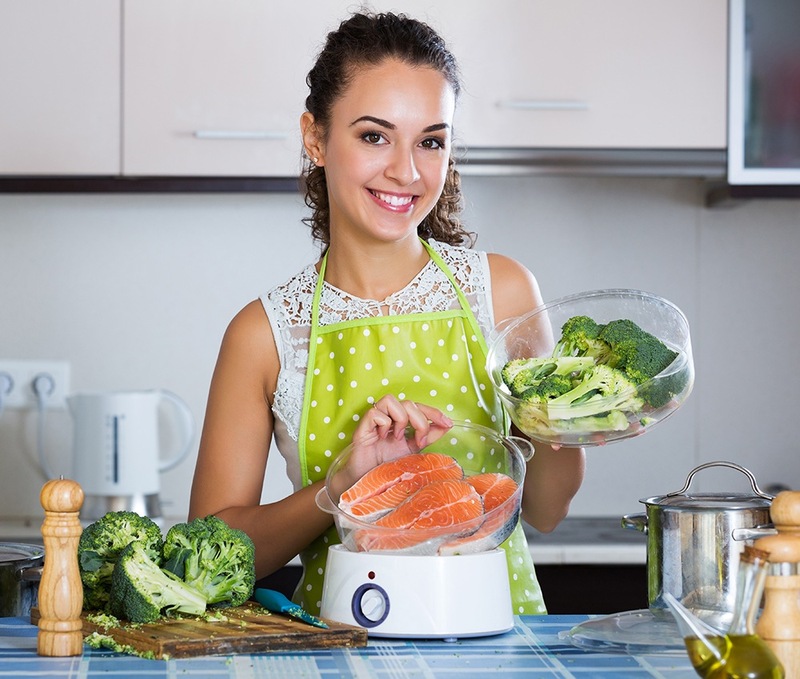 Materials – When looking for a food steamer, look for models that use materials that are safe to come into contact with food. Glass containers are safe but quite fragile. Plastic containers are good too, as long as they’re BPA-free. And of course, units that are made of stainless steel are really good. Just avoid units that come with aluminum parts and Teflon coatings as these have been linked to health problems. Controls – There are full-featured steamers and simple steamers. It’s up to you to choose the included features in a particular model. Capacity – It’s important to check on the capacity of a steamer before deciding to buy it. If it’s only for 1 person or a couple or a small family, a small unit with 1 or 2 tiers will probably suffice. However, if you’re cooking for a large family, you will need a high capacity model – and a unit with 3 tiers will surely be more practical. Price – As long as you can afford it, don’t be discouraged to get an expensive steamer if you really like its features. Of course, we all want inexpensive products, but for something as useful as a steamer – you can consider it as an investment to your health. The things listed below are not major issues to consider, but they’re still worth looking into for safety and convenience. Auto Shut Off – There are models of food steamers that automatically shut off after cooking or when the water runs dry. 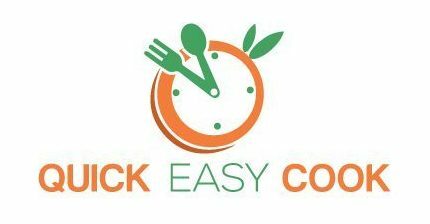 Timer Delay – Having a timer delay setting will allow you to program the unit to start at a certain time so that cooked food will be ready for you. Versatility – Steamers that also function as rice cookers are very practical to have. Cleaning Procedure – Models that are dishwasher safe are easier to clean than units that require hand washing. Storage – Steamers with stackable containers are very easy to store. Listed below are the Top 10 food steamers on the market today. They are ranked according to their overall features – with the Top 1 being the highest in rank. I will review each of the products in the Top 10 list and present to you their features, pros and cons. 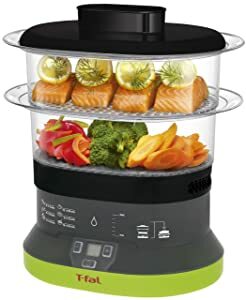 By the end of this post, you will find it easier to decide which food steamer to buy (watch out for my recommendations as well). At the Top 1 spot in this Top 10 countdown is the Rosewill food steamer. This model can be purchased in white color. Power – It comes with the 800-watt motor that can generate hot steam in just 40 seconds. It comes with an auto shut-off feature – the unit will automatically turn off when the water tank is empty. There’s a water level indicator to easily monitor the water level in the reservoir. As the Top 2 steamer for food in this Top 10 list, make sure that you check out the Bella Dual Basket food steamer. It’s available in classic black color. Design – This is a 2-tier model of food steamer. Capacity – It can hold a total of 7.4 quarts of food. Heating System – It uses a patented quick-start system that allows the unit to heat up and produce steam in as fast as 30 seconds. Auto Shut Off – This model will automatically shut off when water runs dry in the reservoir. Materials – The plastic food steamers are BPA-free. Cleaning is easy as the food bowls are dishwasher safe. You can prepare 2 types of dishes at the same time. The containers are BPA-free and safe to come into contact with food. The small numbers on the timer can be quite difficult to see. This is a very useful steamer for cooking. You can use it to steam meat, seafood, vegetables, and even dim sum and dumplings. I like it very much because it uses BPA-free plastic containers. If you are into Chinese cuisine, this model of food steamer will surely interest you. It comes with a bamboo design. Design – It comes in 2-tier design, with each level of steamer measuring 10 inches in diameter. Construction – It’s made of woven bamboo for effective retention of nutrients, moisture, flavor, and color. Materials – There’s a stainless steel banding support so that the steamer won’t burn from heat. Operation – Since it doesn’t come with a heating system, food is cooked by placing the unit in a wok (with boiling water). You can also get a ring adapter so that you can place the steamer on top of a stock pot. The unit is beautifully made. It comes with a good seal – steam won’t escape during cooking. It’s not transparent – so, you won’t be able to monitor your food while cooking. You need a wok or a stock pot to use this steamer. Bamboo materials expand through constant exposure to heat and moisture – and that will lead to breakage. I really like how this bamboo steamer works. Its multi-purpose design allows you to cook meat, fish, vegetables, and of course – dim sum. Cuisinart fans should definitely consider buying the Cuisinart STM-1000 food steamer. If you want it, you can get it in black color. Capacity – The glass container has a 5-liter capacity for holding food. Control System – The control panel is digital and there are buttons for the following functions: start/ stop, pause, and reheat. It delivers fast and even cooking. Since the food container is made of glass, it’s transparent and you can see the food while it’s cooking. It only comes with 1 level of food bowl – you can only cook 1 dish at a time or several types of food in small portions. This 1-tier model of food steamer will work great for a small family. What I like most about it is that the food bowl is made of glass. 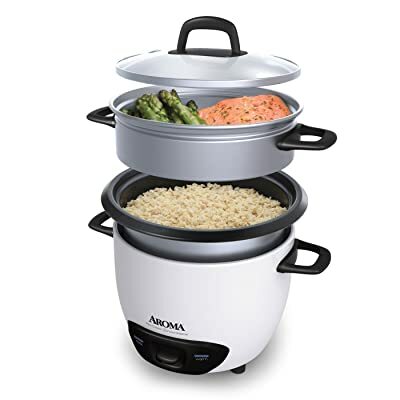 The Aroma ARC-743-1NG food steamer is also a rice cooker. If you’re looking for a 2-in-1 cooker, consider this as one of your options. It’s available in 3 colors – black, white, and red. Cooked Rice Capacity – As a steamer for rice, it can hold 6 cups of cooked rice. 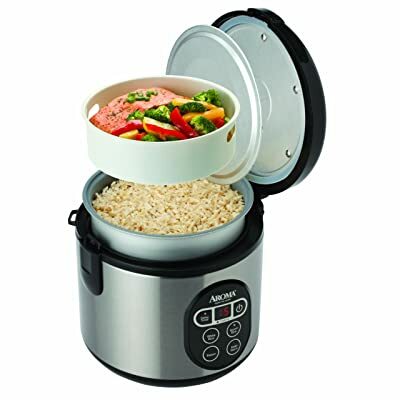 Operation – Since this is a rice cooker and vegetable steamer you can steam vegetables while in the process of cooking rice. One-Touch Operation – You only need to push down a button to start the process of cooking. When cooking is done, the unit will automatically go into Keep Warm mode. Powerful Steam System – Cooking rice and steaming food can be done simultaneously. Accessories – The package includes a rice measuring cup, steam tray, and a serving spatula. The inner cooking pot and steam tray are dishwasher safe. It’s versatile. You can use the rice cooker and steamer simultaneously. You also have the option of just using the rice cooker or just the steamer. This unit is not transparent, so you won’t be able to see your food while cooking. The inner pot and steamer are made of aluminum materials. This is a simple rice cooker that’s very simple to use. It’s great for a small family. My only concern is the aluminum materials used in this model of rice cooker/ steamer. Functions – It can steam food and cook rice at the same time. Rice Capacity – The inner cooking pot can accommodate 8 cups of cooked rice. Control System – It comes with digital controls. Delay Timer – The 15-hour delay timer allows you to program the unit to start at a specific time. Auto Keep Warm Mode – When done the cooking, the unit will automatically switch to warm mode. It comes with a lot of free accessories – a rice measuring cup, a spatula, and a steaming tray. The unit is versatile – you can cook rice in it while steaming other types of food as well. The inner pot is dishwasher safe and easy to clean. This model is not made of see-through materials – therefore, you can’t see the food that’s cooking inside. The inner pot is made of aluminum materials and is lined with Teflon coating. I like the features on this Aroma steamer and rice cooker in 1. However, I don’t like the fact that aluminum and Teflon materials mainly comprise the inner pot’s construction. The Oster CKSTSTMD5-W can be one of your choices when choosing a food steamer for vegetables and other types of food. You can get it in white color. Auto Shut Off – This unit will automatically shut off after completing the cycle of cooking food. And it will also turn off automatically when the water reservoir is empty. Operation – Fill the water tank with water, place food in the steaming bowls, put the cover, set the timer. The food bowls are transparent – food can be easily monitored while cooking. The food containers are easy to clean because they’re dishwasher safe. There’s a power indicator light to let you know that the unit is in operation. The food bowls are not made of BPA-free materials. This is a simple food steamer that’s very simple to operate and use. Its only major flaw (which is a really big issue for me) is that the food bowls are not made of BPA-free materials. Design – This model of steamer comes in a 2-tier design. Removable Divider – The plate divider can be removed to end up with one large-capacity food bowl. Timer – It comes with a 60-minute cooking timer. Control System – It has a digital control system that’s easy to use. This model is compact and stackable for easy storage. You have the option of using 1 tier or 2 tiers when steaming food. The unit is cute and well-designed. The plastics are not BPA-free. The food bowls have crevices that make them difficult to clean. 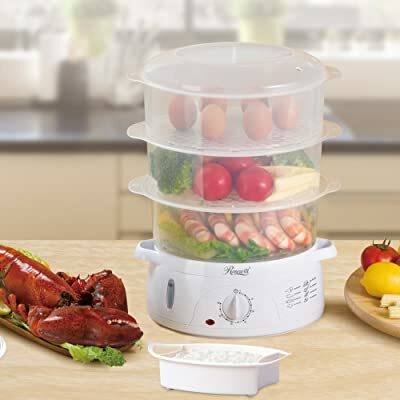 This model of food steamer is suitable for 1 to 2 persons. You can cook different types of food in it – meat, seafood, vegetables, etc. Just be wary that the plastics on this model are not BPA-free. 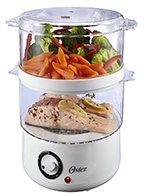 The Oster 5712 is yet another option for a food steamer. It’s only available in 1 color – white. The steaming trays can be collapsed for easy storage. It’s very powerful – it has a 900-watt heating element. The food containers are made of plastic materials that are not BPA-free. 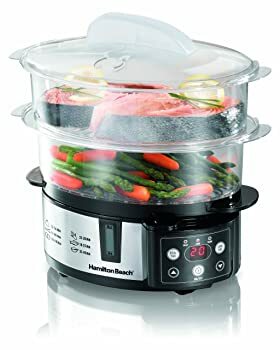 You can consider the Hamilton Beach digital food steamer as one of your options when looking out to buy this type of product. Right now, this model is available in black color. Design – It comes in a 2-tier design. Operation – Fill the water reservoir with water, stack up to the food bowls, set the unit’s timer, wait for it to beep (to signify that the steaming process is done). Removable Divider – The divider that separates the 2 bowls can be removed. This will allow you to steam large types of food in the unit. Auto Warming Mode – After completing the process of steaming food, the unit will automatically switch to warm mode. Cleaning Procedure – All removable parts (except the base) can be washed in the dishwasher. It’s versatile – you can even remove the divider to have one big bowl that will hold large types of food. The food bowl is made to be transparent so that you can see inside and monitor the food that you’re cooking. It comes with easy-to-use digital control. You can use it to steam a small amount of rice. The delay timer feature allows you to program the unit to start at a specific time. The plastic materials are not BPA-free. This is a nice food steamer that will efficiently serve a small family. 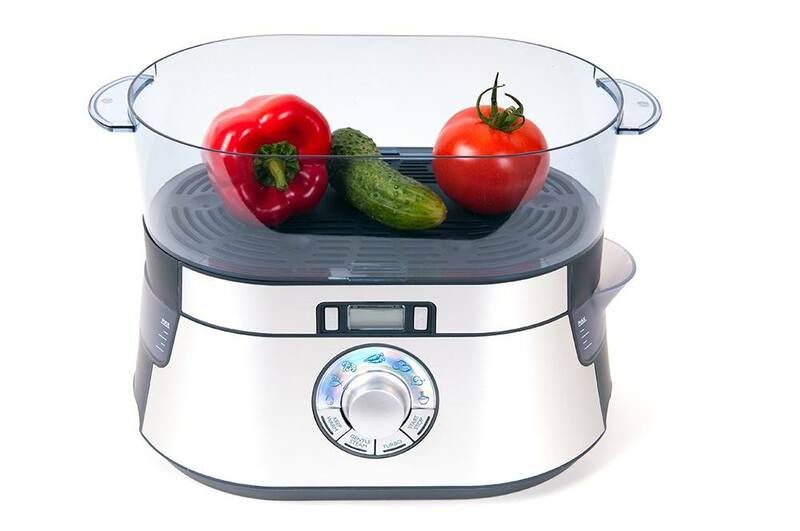 You can cook different types of food in this steamer – meat, poultry, fish, eggs, vegetables, etc. Its only major flaw is that the food bowls are made of plastic materials that are not BPA-free. If you still haven’t made up your mind as to which product to buy, I would like to make a few suggestions. I highly recommend getting the Rosewill food steamer mainly because of its 3-tier design. This allows you to cook in 3 separate containers so that there won’t be any odor and flavor mixture in your dishes. Note that this model also uses BPA-free plastics, so it also works great as a steamer for baby food. As for the price – it’s very affordable. 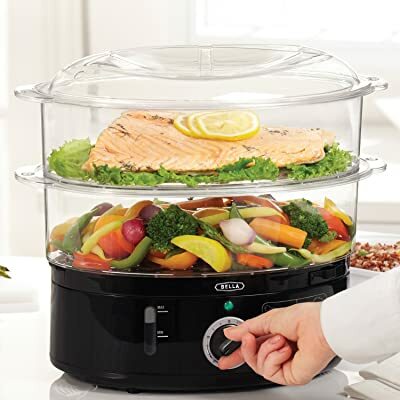 The Bella food steamer also makes for a great choice, but it’s only a 2-tier model. It comes with safety features and also uses BPA-free food containers. And again, it’s very affordable. 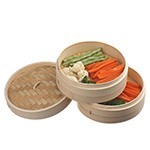 If you’re looking for a bamboo steamer, get the Vonshef model. This is a 2-tier food steamer and it’s made of woven bamboo – it’s, therefore, safe to come into contact with food. I really like its design, and I’m sure you’ll love it, too. Again, this is a very affordable unit. Cuisinart fans will also be glad to know that I’m recommending one of the Company’s food steamers. The model included in our Top 10 list is made of glass (the only one in this post), so it’s really safe to use with food. As for the price, it’s more expensive than my other recommendations, but it’s worth it. The other models of food steamers in this review post are also good. However, I am not recommending most of them because of safety/ health issues. You see, these food steamers (the ones that I’m not recommending) either have aluminum, Teflon coating, or BPA in their construction. I hope my suggestions and recommendations have proven to be useful to you. Do let me know your thoughts and don’t forget to share this article on the best food steamer with your friends.